It was absolutely tipping down when I woke up, so I used what I thought was an entirely sensible tactic of waiting for everyone else to go before hitting the showers, downing the remnants of last night's sandwich and then heading out to do battle with the rain. I found myself walking alone for the first time since St. Jean Pied-de-Port, and fortunately my headphones were working enough to let me listen to most of the BBC's 'Today In Parliament' podcast. The path was rather muddy, which I don't mind so much, provided that I know I'll get a hot shower at the end of the day. When you know your feet are going to get wet it is much more fun to run straight through the mud, rather than try to dance around it. The routine I've eased into is to start out without breakfast, and try to find something after the first hour or so of walking. 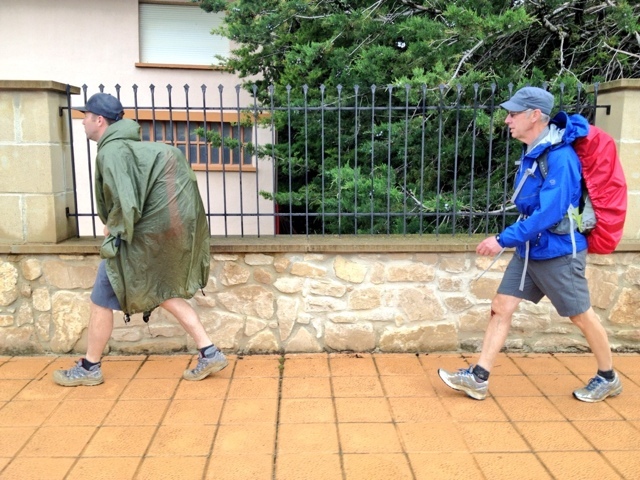 However the café at Mañeru (4.8km) was rammed with people avoiding the rain, and Cirauqui (7.8km) didn't have anything, so breakfast really became lunch by the time I reached Lorca, which was 13.5km of walking into the day. Lorca is a lovely hilltop village with a couple of cafés on opposite sides of the ancient cobbled street. I ordered a bowl of pasta and a cup of milky coffee, and enjoyed the respite from the rain, which was helped by the free wifi and charging point at the table. After an hour Estelle (the Frenchwoman I'd met a few times in the previous few days) walked in, which was lovely as I'd felt like I'd lost all the people that I'd started with. And shortly after that Ron and Kib appeared at the cafe's counter. I know it sounds weird but it really did feel like we'd been reunited - a really great moment. They'd stopped yesterday a couple of towns before Puenta la Reine, and were most amused to find that I was actually ahead of them! 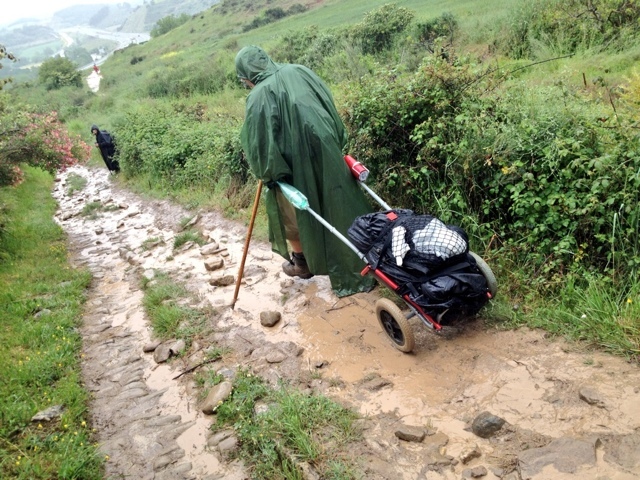 Estelle wanted to press on, and so we said goodbye to her and carried on drinking coffee for an hour before rejoining the stream of people heading towards Santiago. 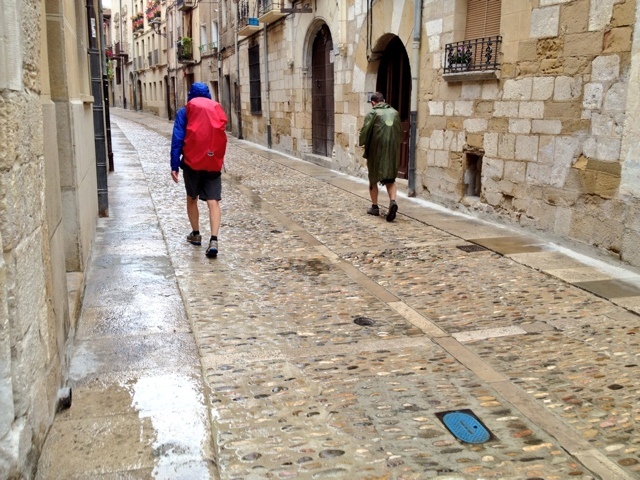 Ron had slipped on the wet concrete earlier and wasn't quite the speed demon of previous days, and what with my love of the wet and long days of walking they decided that I should seriously consider ironman competitions. However the decision to have a short day with them and end in Estella was an easy one - not much ironman willpower from me on that, I'm afraid! We checked into the town's 'juvenile hostel' (just before Sergio the Italian roller case man) and paid a little more to have a room just for the three of us, which is bliss after the last few nights of staying in dormitories. Ron took us out for supper and I had the most delicious steak, which practically melted in my mouth - a definite upgrade from the €8-10 pilgrims' menu.